Thieves Like Us are an electronic trio, two thirds Swedish and one part American. They met in Germany. Their music sounds similar to New Order, the creators of their namesake. They describe themselves as "Half Daft-Punk. Half Factory." Fans of Cut Copy will definitely appreciate their synth heavy blend of pop and dance music. They have recently been signed to Kitsuné and appeared on their fourth compilation, a definite springboard to a broader audience. It's happening this weekend so I thought I might put something together and well, I'm too busy during weekdays with school at the moment which means posting lots of songs in this entry to kill the time until I return. Below is a mix of tracks by some of the artists from the line up including remixes and covers; enjoy! All I can do now is wait...5 days to go. Half a day long road trip up the coast to the briskful Bryon Bay for the two-day experience. Or shall I say “HI I HAVE NOT SEEN YOU IN ABOUT A MILLION YEARS? !” Ok so maybe not a million, but hello! I have basically been on hiatus – ok not really I just really wanted to use that word in a sentence. Right so I know you have all desperately missed my beautiful, lyrical and musically ingenious weekly/fortnightly/yearly (ha!) blogs/posts. But I cannot really say you missed me, actually, now can I? I must say all the music you little chaps are being graced with by my lovely co-bloggers are nothing but miraculous!! Enough chat and more music right? As many have heard; Klaxons had to cancel their tour to Australia. Yes, that means cancellations on the beloved Splendour in the Grass. Never fear; Hot Chip has gladly stepped in to fill the set with a DJ set. I know it will be amazing. Expect to hear tracks off their DJ Kicks compilation (features My Piano – which I posted quite some time ago, which might I say got an absolute beating in downloads). As for this track – like a pal of mine said: this would be amazing if it was properly recorded. It certainly shits on JT’s version regardless. Spoon’s new instalment “Ga Ga Ga Ga Ga” is a sure hit. With mentions in many mainstream newspapers (mX to name one), it is all but smooth sailing for Spoon. This instalment in short – the album only accumulates to just over a half hour of tantalising music. Do not let that fool you – in this case; it is certainly quality over quantity, which many musicians over look with their additions of “fill-in tracks”. You know what I’m talking about – Uh-huh. Everyone (who knows me) knows how I adore fabulous remixes. Don’t get me wrong – there are some that turn out horribly wrong. This song takes this track to a new height. A typical indie track – which is usually not in my taste – however my mother and I quite enjoy watching the Drummer with his head down, fringe long just beating his skins (drums) like there is no tomorrow – in their clip for Lazy Eye. The introduction of great African inspired conga drums and other percussion instruments interlock amazingly for this track. Right so you all know I have a fond uh, let’s just say likeness towards Hot Chip. They are regular participants in my blogs. This track is.. I suppose indescribable. The beat, the voice, the melody – it all simply works. We all constantly listen to albums and hear one track that just - works. Everything seems so timelessly and uniquely connected into a string of 4-minute brilliance. This is one of those tracks for me. Smile, breathe and simply live. I wouldn't say that any specific decade was better than any others music wise in the last 50 years of contemporary music. However apart from the current decade, the music I find myself listening to tends to come from the 80's. To me the 80's was the birth of post punk, the meshing of the avant garde noise with more (un)conventional rock elements. As well as the expansion of other genres such as hip hop or dance and how they all influenced each other. 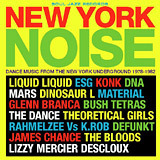 The idea for this mix came from the Soul Jazz compilation New York Noise which is an amazing overview of New York underground music in the 80s ranging from dance punk (Liquid Liquid,Material) to hip hop (Rammellzee). this track sends chills up my spin. It feels like it should be the soundtrack for some post apocalyptic sci-fi film. This tracks eery, warped sound was created through heavy manipulation of tape loops. I think I first heard them on Hot Chip's recent DJ Kicks compilation. I only recently give them a proper listen. I think they are an acquired taste but they are well worth listening to. Very much ahead of their time, their minimal punk funk sound can be most heard in contemporaries like The Rapture or !!! Recently they reformed and played a series of shows through out the United States, Canada and Europe and have been remixed by the DFA. I first heard this song during an Avalanches DJ set. I haven't been able get enough of this track. It sounds like Kraftwerk going ghetto. This song has all the elements that I like about hip hop. The "wicky wicky" of early scratching, a great beat and catchy repetitive lyrics(both in the form of a sultry female vocalist and vocoder awesomeness). Experimental funk, with a great groove to it. They have a cowbell. Sharing the same label as Joy Division , Factory, comparisons are easy to make. However, rather than create electronic, synth heavy morose post punk that Joy Division created in Closer and then later as New Order, they took a funkier approach. Mixing elements of avant jazz, disco and punk to create a distinct and fresh sound. Another under appreciated band which influenced todays heaviest "indie" contenders such as Editors or Interpol. their sound can best be described as a mix between the heartfelt lyricism of The Smiths and the electronics of New Order and the dreamy texturing of My Bloody Valentine. The Ruby Suns are full of sunshine and safari animals; previously known as "Ryan McPhun and The Ruby Suns" after relocating from California, United States to Auckland, New Zealand where McPhun (also a former touring member of The Brunettes) has brought over some conventional psychedelic rays of beautiful lo-fi pop to our sleepy southern winter. Inspired by the simplicity of New Zealand and its nature, McPhun found himself well suited to his surroundings with the shared love of music from ostentatious productions by Curt Boettcher and Brian Wilson-esque harmonies to modern DIY indie noise pop of The Apples In Stereo and Yo La Tengo; the octet are a big band, generally meaning lots of noise, but that's not really the case on the album compared to their stage performances which do incorporate that. Self titled; their album musical arrangements are kept minimal, putting emphasis on the lyrical content which span from random imagination of kids shaped as trees to soup. The Ruby Suns will be supporting The Shins on a sold-out tour (and a few of their own shows) in Australia in August, which I will be attending. I'm not sure if its a coincidence when The Brunettes toured with The Shins in the US, they gained a lot of fans. It could look possible for The Ruby Suns (they are wonderful and fun live), seeing as they are one of Popfrenzy's latest signings. Details about shows can be found on their myspace page. The Ruby Suns Look Out SOS! Having dated before, Jonathan Bree and Heather Mansfield make up the core members of Auckland, New Zealand twee pop band The Brunettes, with their sweet baroque ornamentation of male/female vocals, a reflection to that of 60's pop harmonies. The Brunettes are soon to release their third album "Structures and Cosmetics"; nine tracks of exploration of the deeper and dramatic side with most tracks on the album clocking four to four and half minutes compared to their usual short and sweet songs. Structures and Cosmetics takes the band to a new stage with some element of experimentation, like the title of the album its done by dressing up their music in a fashion of creating a new brand of pop each time which they continue to do so every time a new record is made. The first single "Her Hairagami Set" from the album comes off as an the usual Brunettes' ironic twist, but strangely this time it's about "hair", mentioning types of knots and whatnots as Jonathan sings "Doesn't she look a million with her hairagami set?". Needless to say, watch the video. In the last week or so, I have received so much music it's quite frankly really funny. So instead of taking months to ramble out posts about each album I have received, why not knock them all out with one post? Sure. Over the last few weeks I have been ridiculously overplaying Expatriate's debut album, In The Midst Of This. I have to say, this is one fine release, the boys have really outdone themselves here. I'm normally not really a fan of the sort of rock they do, but by golly is this contagious. The 6 minute epic song Are You Awake? is possibly the best song I've heard all year. My dad gave me a copy of Joanna Newsom's Ys last week. Before listening to it I was only aware of a couple of songs on the album, which is pretty much half the album. It amazes me that Joanna has the capability to remember all the words for the songs that exceed way pass the 15 minute mark. She's definitely a little genius indeed and if anyone's aware of her work beforehand they should straight away jump on board with this. This band freaks me out, but in a really good way. Their music is completely over the shop and the band just can't stick with the one sort of style, they always have to broaden their look at electronic music. In some cases, rip off 80's rock riffs, do a metal song, and just have some creepy vocals. It works, believes me, it works. Is it just me, or do these guys have The Cure written all over them? Their debut release a couple of years back I let slide, I thought their only just beginning they'll eventually grow into something. But no, they sound more and more like The Cure with every release and their soon-to-be released Our Ill Wills will further prove that. But in all honesty, their new records pretty damn good. Ah, Tilly And The Wall how you will always keep me entertained. Bottoms of Barrels recently (finally) got a release down here in Australia, just in time for their tour in a fortnight and I would really like to see this release push the band that extra step forward. They really deserve it, their probably one of the hardest working bands around, literally; I mean tap shoes instead of drums, thats crazy. I'm glad rock isn't suppose to be pretty, because let's face it, these guys aren't exactly pretty on the eye. But all looks aside, their music is the latest craze and I can see why. Their whole new look on rock and roll is what this world needed and I'm glad it's these guys doing it. Their singles are being lapped up like crazy and to make things better, their heading our way in September. I recently made a post about these guys, so I don't need to further explain my love for them, but I did just pick up their single Dr Love, which was officially released the other week. There's a few b-sides worth mentioning, such as Architecture In Helsinki's try at covering the song (which turns out to be 7 minutes long, and the Soft Tigers splendid remix. Next weekend I will be making my way into the city to hopefully witness the beautiful act that is Architecture In Helsinki. This will be my first time seeing them in the flesh and after giving their new album, Places Like This, a bit of a spin last week, I'm looking forward to this. I have been playing around with some DJing software on and off for a few months now. Here is my most recent at best attempt at making a cohesive mix. I re-cut it into individual tracks which can be saved independently or as an .rar. The first track is essentially a mash up of a Daft Punk instrumental, from Discover, Verdis Quo and Cut Copy's Future. Its not one of those gimmicky mash-ups but just one that makes sense.Blue Monday is a bit self explanatory. I really love Feist's new album and all the subsequent remixes. You wouldn't think that hand claps, an 808 drumbeat and a vocoder would go so well with this disco folk diva but it works. Simian Mobile Disco have recently released Attack Decay Sustain Release which is comparable to Justice's † though in my opinion not as consistent. However, it has its moments and this track is superb. I really feel that The Go! Team are meant for the dancefloor but every time I request them at assorted indie nights they are never played. Their eclectic combination of samples 70's action TV show themes, blaring horns, a double dutch chants and an insane beat from their two drummers. I've mentioned them before and here I am to do so again. There simply isn't enough of Wellington, New Zealand quartet, So So Modern out there. I had the opportunity of catching them live doing a double record release with Cut Your Hands Off as well as other favourites: The Ruby Suns, Bear Cat and BrandNewMath at the Kings Arms in Auckland whilst I was on a short trip in the holidays and impressive they were. The energy the deliver is just incredible and crowd reaction was one of "those places" you had to be in, all in which fit perfectly in the compact venue. I'm not much of an electro fan but these quirky guys are an exception because they are just too good to pass up. They're one of the bands I've loved watching grow and will continue to do so. Looks like they'll be busy touring Europe for the remaining months. Their latest EP Friendly Fires has been out for some time now and I've only recently had my ears attached to it. Its rhythmic and layered synth driven hooks create this futuristic sound which what makes this EP exciting and fresh. Like my ever changing phases in music, I'm always up for something new and different and if what I imagine the future in music to be like in any possible way, I'd like to think So So Modern have done a startling portrayal of that. End of year top list contender? They'll be there.